Most home owners look to add wooden beams to their ceilings, in order to give the room a much bigger and better architectural appeal. However, it is rather costly to add so many wooden beams, which is why some people look to add faux wood beams, which can give you the same visual appeal for a much lower cost. 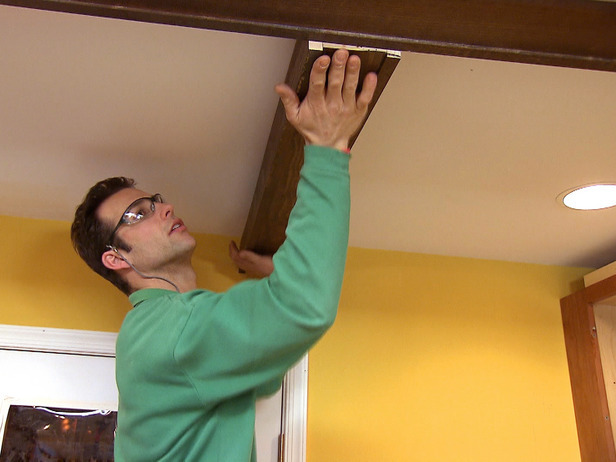 A faux beam is much lighter and easier to handle then a beam that is made entirely out of wood. As a result, the installation process becomes a whole lot easier, and it is also very convenient to make changes later on as well. You need to start off by measuring the inside of your faux beam. Once you do this, you need to cut off some pieces of scrap wood to this measurement as you are going to need to use both of these later on. While doing this, you also need to identify just where it is that you are going to be placing your beams, so you need to make sure that location you have selected is ideal for the beams. After finding the location make markings on the walls. The next step you need to do is to measure the length of the beam that you need to attach. Make measurements from the walls and make sure you don’t over measure or under measure. Now before you can attach the beam, you need to add the scrap wood you had previously cut out. This is done by attaching these blocks to the walls. Keep it inside the lines that you had measured previously. Now slide the beam onto these blocks and make sure that it slides on right. Cut off any extra parts that might be sticking out, or seem like they just don’t belong there. Now use an adhesive gun and use it to make sure that the beam is secured in place and that there is no space between the wall and the beam. Once you have done that, use screws and other materials to enhance the beams position and stability. After having done all of the above, you can finish off by covering up the screw holes, with some fillers and by scraping off more excess material that is out of place. At the same time, just make sure that the beam is secure so it doesn’t move about at all.